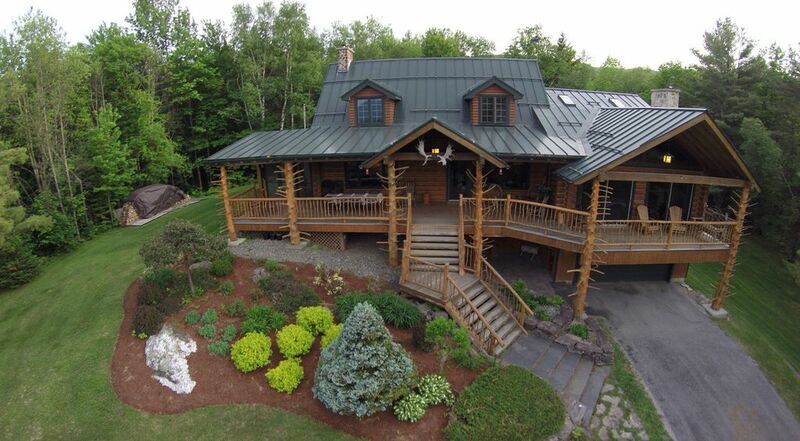 Nestled on 86 secluded acres in the Green Mountains, the Adirondack style Moose Meadow Lodge in Waterbury, Vermont invites you to enjoy a truly unique experience. Make yourselves at home and enjoy the peace and serenity of our secluded property. With 4 luxury guest rooms and magical 2-story treehouse (open seasonally), the property includes a hot tub, hiking trails, a trout pond, and the Sky Loft - a glass-enclosed gazebo at the highest point of the property with panoramic views. A Vermont log cabin like no other, the Moose Meadow Lodge is close to Vermont's most popular attractions, including Ben & Jerry's Ice Cream factory, and the ski resorts of Stowe, Sugarbush, Bolton, and Mad River Glen. The friendly village of Waterbury, where you'll find everything you need, is only three miles away. Owners live on site. This Is Not Your Ordinary Log Cabin: Here's a rare chance to experience luxury log home living. Each guest room is decorated with a unique theme and many handcrafted details. All rooms feature a private bath, distinctive log walls, comfortable beddings, great views, and at least one resident Teddy bear. With 4000 square feet of living space and 86 private acres with a private stocked trout pond, you'll never feel crowded at the Moose Meadow Lodge. Note: The Treehouse is available seasonally as part of the full rental from late May to late October. The main lodge is available year round. Are You Ready For Fresh Air, Peace And Quiet? : You're sure to find it at the Moose Meadow Lodge. Entering onto its long driveway surrounded by maple, spruce, and birch trees, you know you've arrived somewhere special. Enjoy a vigorous hike through our 86 acres and head up to the Sky Loft, a glass-enclosed gazebo on the highest point of the property with panoramic mountain views. Or, enjoy a lazy afternoon by the stream-fed trout pond. Rustic Furnishings And Contemporary Comforts: Decorated with deer antler lamps, fly fishing rods, Amish twig rocking chairs and other Adirondack elements; the living room is as casual as it is comfortable. The Great Room is where guests sit around the fireplace while enjoying the mountain views with our collection of wildlife trophies, including our signature 19-point moose, wild turkey, pheasant, deer, black bear, fox, caribou, bob cat, mountain lion and perhaps the only African water buffalo in Vermont. Willie Docto (left) and Greg Trulson are committed to providing a comfortable, fun, and make-yourself-at-home atmosphere at the Lodge. Incidentally, the two met in 1992 at a log home in West Virginia and have stayed at many log lodges ever since. In 1996, these former Washingtonians moved to Vermont to pursue their dream of owning a Lodge. They bought a single-family home on 86 acres, and after a couple of years of research, planning, fishing, hunting and renovating, they opened the Lodge in October of 1998. In addition, Willie owns the only association management company in Vermont and produces festivals, concerts and events. He is also a freelance classical violinist, performing in orchestras in Vermont and Washington, DC. Greg is a former computer systems architect and trainer. He is an accomplished woodworker who created many of the furnishings and rustic decorations in the Lodge. His twig furniture and other works are made with wood from the property. His creations have been commissioned by people from as far as Maryland and Puerto Rico. Both are very involved with the community. Willie was appointed by Gov. Peter Shumlin and re-appointed by Gov. Phil Scott to serve on the Vermont Travel & Recreation Council. Willie is founder of the Vermont Gay Tourism Association and the Eleva Chamber Players. He is also Past President of the Waterbury Tourism Council. Greg is Treasurer of the Eleva Chamber Players and is an elected Justice of the Peace and for many years served on the Duxbury Cemetery Commission. Greg officiates at weddings and civil marriages at the Moose Meadow and throughout the state. Our goal for all guests staying at the Moose Meadow Lodge is to provide the best customer service, so that during your stay you'll see something, do something or experience something on the property or in the area that you never thought you would prior to coming. When the time comes to leave our goal is to take with you a memory that will last a lifetime. toilet, Bathroom off hallway with local artists outdoor painting. toilet, shower, Two person steam room and shower. The Additional Bathroom is a unique custom half bath with real birch trees as railings and walls painted with trees and animals by a local artist to look like you're standing outside on a deck. We are located in the mountains overlooking the Worcester Range and Hunger Mountain. The lodge looks North onto the Worcester Range and Hunger Mountain. Two fireplaces with wood burning inserts. Owners live on site and are available to provide concierge service, suggest tours, restaurants, area activities and to assist with anything pertaining to the property and local activities. Smoking permitted outdoors only. We traveled to moose meadow lodge for a ski weekend with friends and had the best time! Greg and Willie were welcoming and kind from the day they accepted our request to rent! They truly made the experience special, and a ski vacation with friends we will never forget. Both Willie and Greg answered any and all questions we had promtly, and they were very accommodating. I do have to note, that I was a little nervous to have both Greg and Willie on site while we were there since I have never rented a place with owners on site before; but I have to say that it was not a problem at all! They welcomed us with huge hugs and gave us a grand tour of the house which came in very handy. They made us feel at home and told us that they are not bothered by noise and to make as much noise as we wanted; with 11 adults, and two loud talkers, I felt very at ease after Greg mentioned this. I do have to say to read the descriptions of the rooms carefully. The futon in the mountain room only really sleeps 1 comfortably so in total the house sleeps 8 adults in beds comfortably and 1 adult on a futon comfortably so 9 adults total. They do have cots they can make up, and you can bring air mattresses but just a heads up in case you don't want to give up a bed. Their office is above the living room and they would pop through the house every so often but it was not a problem at all, and they were very respectful of letting us enjoy our time. It was great to have them there to answer any questions or advice on where to go in town. The property is very beautiful and is perfect for a secluded and relaxing vacation. There are snow shoes you can borrow (7 to be exact) and several of us used them to climb to the sky tower on the top of the property. This was a very enjoyable experience and it was nice to have this included in our stay. The treehouse is closed during the winter but a perfect getaway when open. We would definitely recommend moose meadow lodge to anyone looking for a relaxing vacation away. Willie and Greg are professionals and truly a pleasure to be around! Your time at moose meadow will always be remembered and they even have merchandise to buy so that you will never forget your special trip away. We bought some mugs and syrup that was extracted from the trees on the property! This was a vacation to remember and we hope to come back one day soon! Enjoy! We rented out the entire house at Moose Meadow Lodge to share a standard fun + relaxing ski weekend with friends. But Greg, Willie, and their beautiful home made it so much more than that. When we first arrived, we expected the usual hands-off home rental instructions, "Find the keys under the mat," with no one around to contact in case of a question or emergency. Instead, we were pleasantly surprised when Greg and Willie greeted us with open arms and full bear hugs. They proceeded to give us a full tour of the property so we didn't have to spend an hour figuring out where stuff was or how it worked. It was fascinating to get a full download of the house, especially with its one-of-a-kind design. Most of the sinks were either carved made from gorgeous stone found on the property or petrified wood. Double occupancy steam showers grace 3 of the rooms. One bathroom was hand painted to look like it has 3 walls of glass looking out onto the snow-covered woods, complete with 22 animals dispersed amongst the trees. The house felt like a museum, covering the history of the area and peppered with many taxidermied animals (which were consumed in full when killed, so its sustainable hunting). Greg and Willie encouraged us to make ourselves truly at home and had tips and advice on any and every question we asked about the area. Ski tickets? Sure. Taxi service? Yup. Brewery tour? Greg could take you. It was nice to know they were well-informed residents and proactively willing to go the extra mile to make sure our stay was extra special. Greg even popped in to socialize throughout the weekend, which may seem odd if you're reading this, but he added a lot of fun to our activities and was a great storyteller. At one point, he had the entire 12 person group obsessing over funky puzzles -- like making a T out of 4 oddly shaped wooden pieces. He even convinced the group that one member was a telepath with a hilarious card trick he had up his sleeve. It was nice to spend a weekend actually spending time doing an activity together instead of just playing drinking games or staring at our phones or a tv screen. Comfort-wise, the beds were amazing and the rooms very cozy. Stowe Mountain was 40 mins away so MML is a pretty good option for skiers, especially for the comfort level you're getting compared to some of the Stowe inns. Clearly, Greg and Willie have so much love between the two of them that they can't help but share it with any and all guests of Moose Meadow. Thank you, Ben for your kind words. We're so glad you and your group had a wonderful time in Vermont and on our property. We appreciate being able to share this very special place and our beautiful State with fun and respectful people such as yourselves. We look forward to seeing you all again in the future. Moose Meadow Lodge in Waterbury, Vermont is minutes away from the area's most popular attractions like Ben & Jerry’s Ice Cream factory, Cabot Cheese Annex, Lake Champlain Chocolates, Cold Hollow Cider Mill, Vermont Liberty Tea Company, Lost Nation Theater, Vermont Festival of the Arts, Mad River Craft Fair, skiing at Bolton, Stowe, Sugarbush and Mad River Glen ski resorts. Minutes away are also horseback riding, canoeing, fishing, sleigh rides, snowmobiling, and dog sledding. Ski: We pass on to all our guests discount tickets for each of the local ski resorts, Bolton, Stowe, Sugarbush and Mad River Glen.